This year we have seen so many companies releasing their portable multimedia and internet devices. Apple iPad, the Joojoo, HP tablet, Dell Android tablet and number are growing. Sony recently added their contribution to this list by announcing Dash personal internet Viewer. 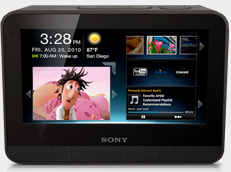 Sony Dash is a compact gadget that can be used to surf internet, watch movies, play games and music. Sony Dash comes with support for 1000 plus applications and widgets of websites and web services that we use daily. This compact device comes with 7 inches TFT touch screen that has 800×480 pixel resolution. All these things are available at a very low price point, making it one of the best upcoming portable internet viewers. Sony Dash is your personal dashboard of entertainment. For now Dash has only WiFi connectivity for accessing the internet. The inbuilt applications include social media, online streaming, photo editing, uploading, weather and traffic updates and apps for offline productivity. It can be used as a music player or video player when no internet connectivity is available. There is a pair of speakers and a headphone jack. The vibrant TFT display of Sony Dash is fully customizable. It has accelerometer support for auto rotation of the screen based on preferences. Users can change its background, applications displayed, etc. Sony Dash also provides an USB 2.0 interface for transferring media files to the device. 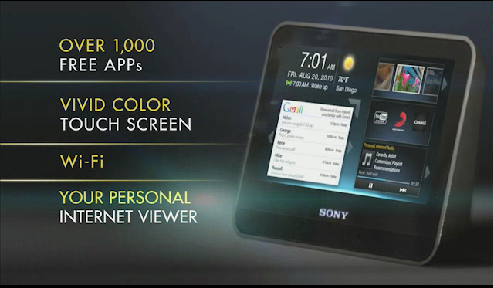 Sony Dash Personal Internet Viewer will be available in US from this summer for a price of 199$. So converting to Indian rupees, it’s around 9000 INR. Overall the features of Sony Dash portable internet viewer is very impressive. We won’t get iPad alike web browsing experience in Sony Dash. However, the interesting thing is that this low price device has some features that iPad lacks. We expect a 3G enabled version of Sony Dash with few more applications in coming few months. Great! I am the fans of Sony products.